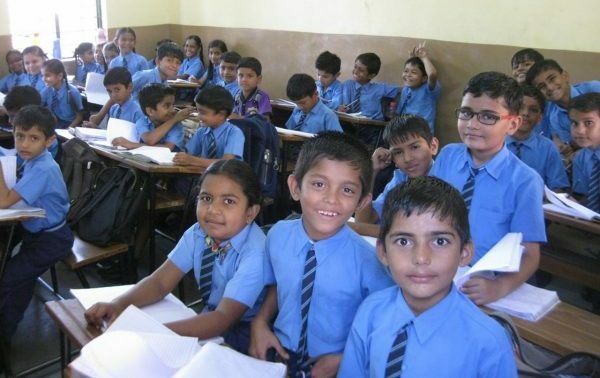 The HOPE foundation school in Ashapura Nagar slum in Bhuj, Gujarat, is part of our rehabilitation efforts in the aftermath of the devastating earthquake that struck Kutch District of Gujarat on January 26, 2001. We built the school – which is quake resistant – and a small hospital on an acre of land donated to HOPE foundation. Most of the parents of our students work as daily wage laborers, auto-rickshaw drivers and street food vendors whose average monthly incomes is Rs 2,500 ($46). With its low fees and qualitative education, the school has given the children of Bhuj and their families hope for a better future. In 2010, the school upgraded to 8th grade. At the present, 412 children go to school here. Thanks to the support of SAP Labs, the school is equipped with state-of-the-art facilities to make learning fun and interactive for the students – such as WiFi, videoconferencing equipment, smart classrooms, a computer lab, a science lab and intuitive learning software for English, Science and Math lessons. To encourage the students, we also have weekly and monthly awards to recognize good behavior, discipline, attendance, punctuality, team play, class performance and extra-curricular activities.